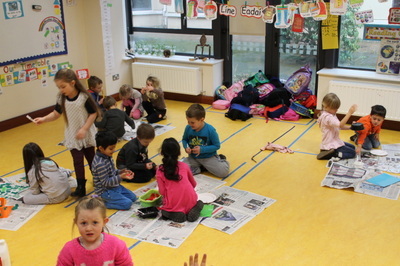 Maggie's Class were busy making a healthy salad to eat. This was a very special salad. It included the lettuce that planted ourselves and grew in our classroom. First we had to pull the lettuce, then we had to wash it. After that we added it to the bowl. We then added some other vegetables to make our salad nice and tasty. Finally, we ate our healthy salad. Look at the photos below to see all the fun we had. Junior Infants have been busy learning all about the different type of homes we live in and the different ways we can travel. We talked about lots of different ways we can travel by land, by air and by sea. Some of the cool ways to travel we learned about included hot air balloons and submarines. We even listened to the Beatles song Yellow Submarine. It's very catchy and it wasn't long before we were all singing along to it. 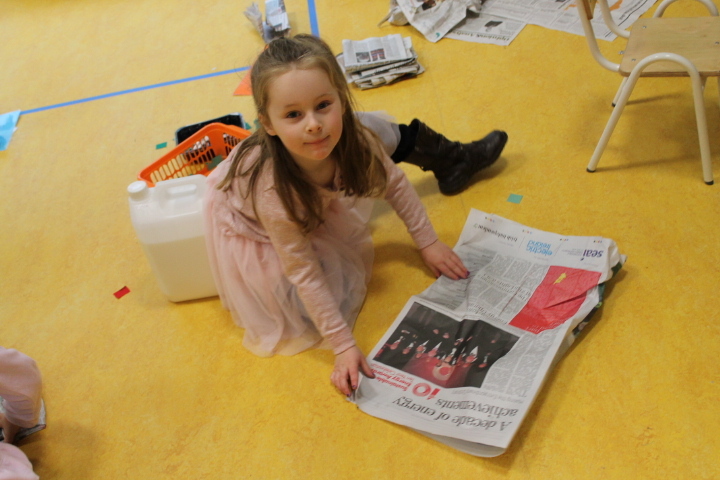 Have a look at our photos below to see what we have been up to for this topic. 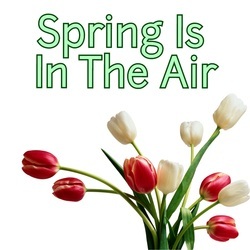 We've said goodbye to Winter in Junior Infants and hello to a brand new season - Spring. Our green-fingers are well and truly working now! 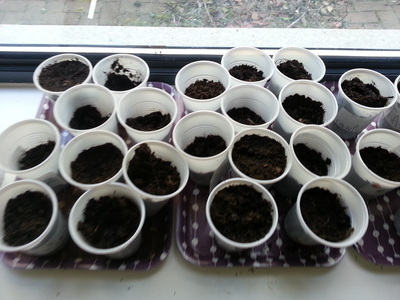 We've been very busy planting seeds. First of all we looked at the packets and read the instructions together. 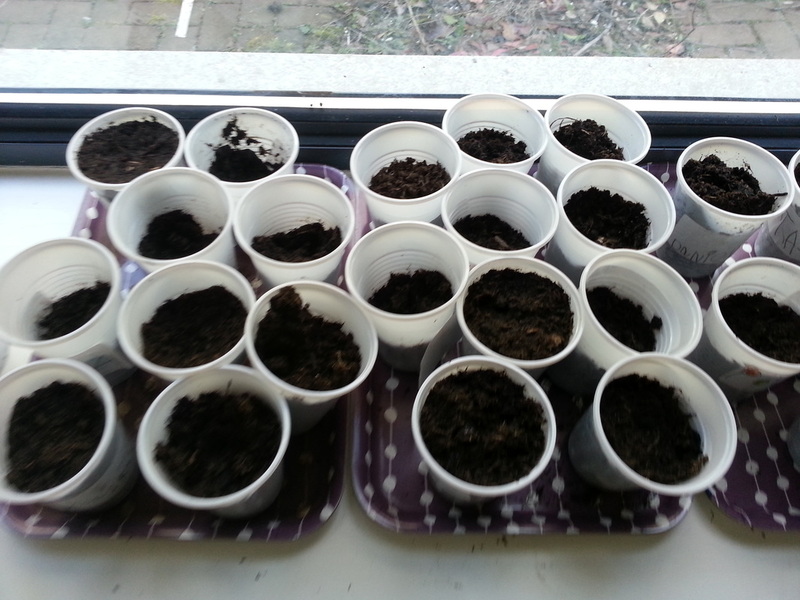 It was fun trying to guess what the seeds would look like before our teachers opened the packets. 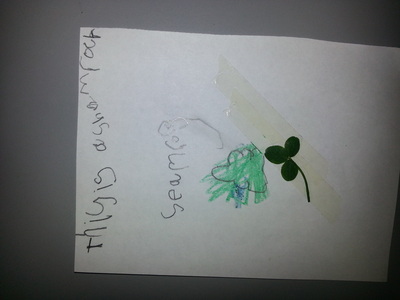 We're learning about all the things a seed needs to grow into a plant. These are water, sun, soil, time and space. 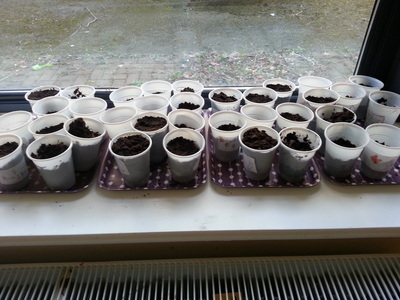 Some of the things we are growing include flowers and vegetables (lettuce, rocket, beans, carrots and potatoes). When the vegetables are fully grown we will get to taste them. We need to be patient though and look after our seeds so that they grow up into healthy plants. 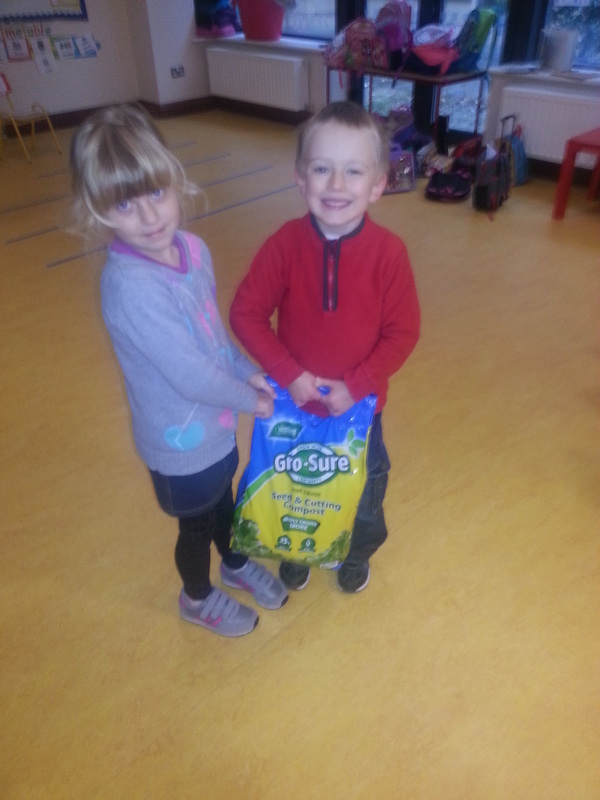 Múinteoir Aoife kindly gave us some Pinto Beans! 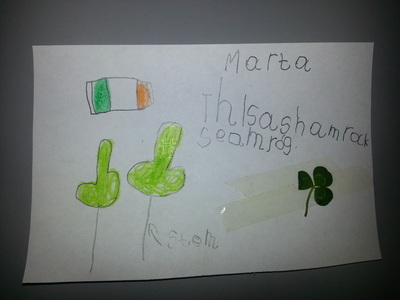 Go raibh maith agat Aoife. We have a special plant growing for you too. 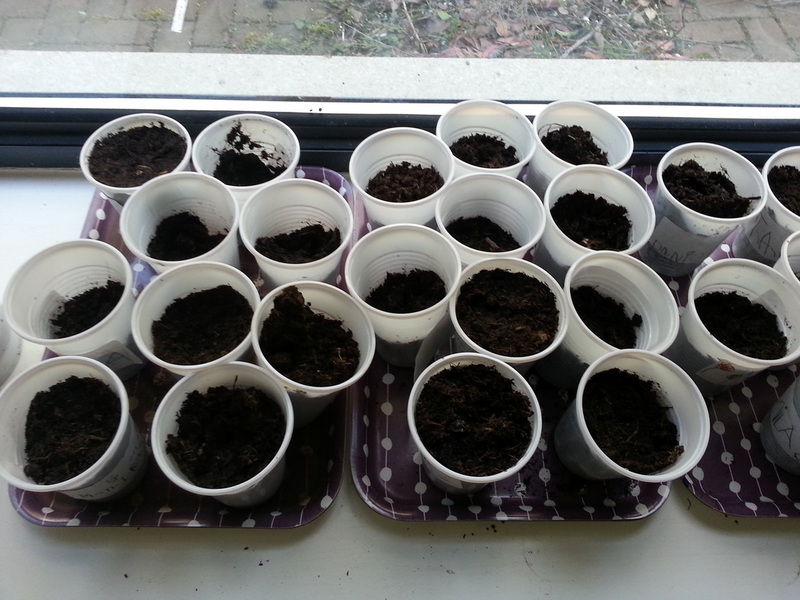 We're growing our beans just like Jack did, but we hope there won't be a big scary giant at the top of our beanstalks!! When we opened the compost bag we had a surprise waiting for us. There was a spider in there. 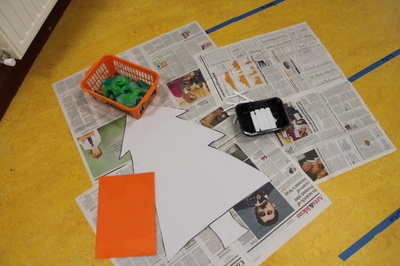 There was great excitement when this news traveled around the classroom. 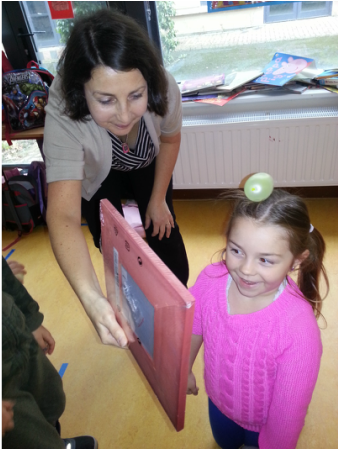 We were very careful with the spider and after we all had a good look we released it outside where it belongs. 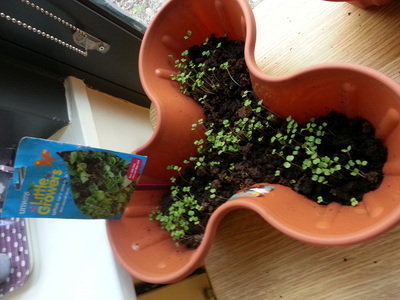 Keep an eye on the website for updates on the growth of our plants! Is maith linn a bheidh ag foghlaim trí Gaeilge i Citywest! 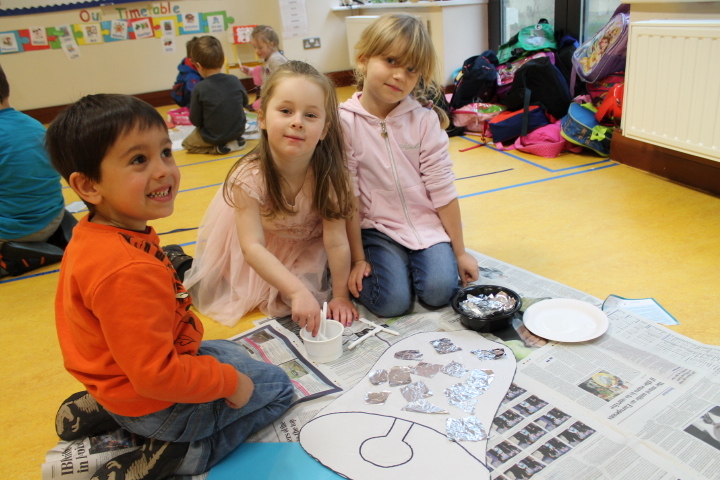 Last week was Seachtaine na Gaeilge 2014. 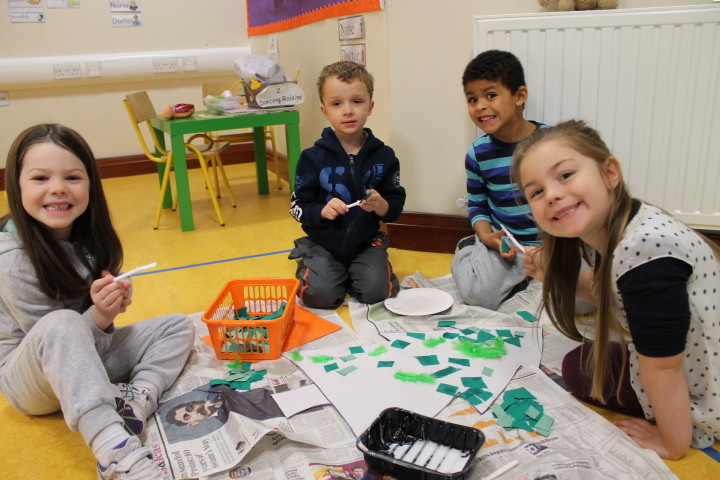 We had great fun using all the words and phrases we know 'As Gaeilge'. Why not ask your child some of the words they know in Irish. I'm sure they will be happy to teach you a 'cúpla focail'. The boys and girls also had their eyes wide open during the yard. 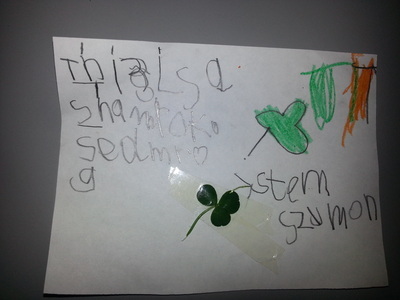 They found Shamrock growing under the bushes! 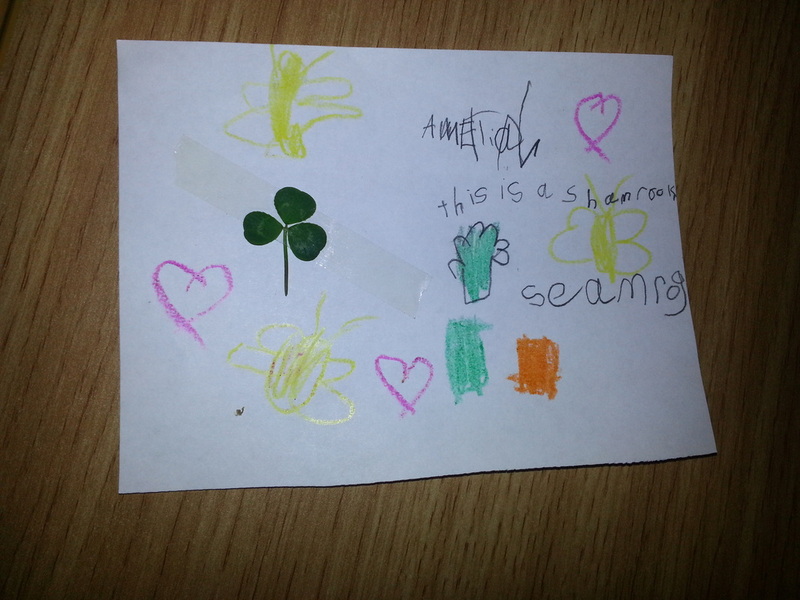 There was great excitement as they recognised the National Flower of Ireland with it's three heart shaped leaves. Look what happened when they brought the leaves back into the classroom. 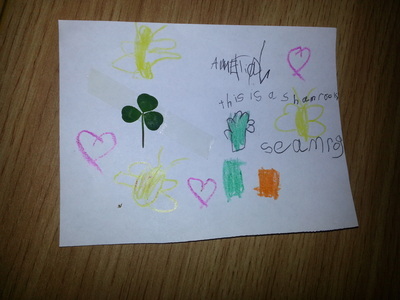 Did you know that the word for Shamrock as gaeilge is 'seamróg'. 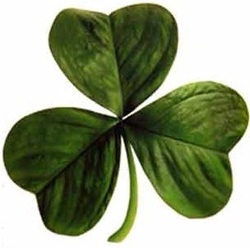 Tá fhios againn anois. 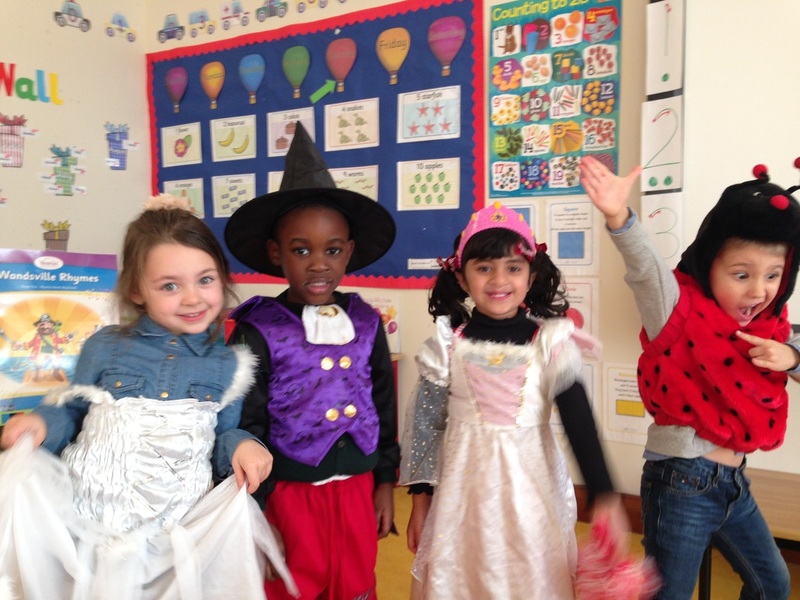 Have a look at some of the fabulous costumes we wore last week as part of International Book Week!! As part of our Play Rota we have opened up a Role Play area where we visit the Opticians to see if we need glasses!! First we have to make an appointment with the Optician. This involves a lot of work for the boys and girls working as the receptionists! They have to take the customer's name, then check the colour of their eyes and finally discuss the different types of glasses they may need. Next step is the eye check! The Optician preforms an eye test on the customer and using the eye chart he or she decides if they can read the different letters correctly. The next step is choosing the suitable glasses and trying them out!! Finally its time to try on the new glasses and see how they look! Have a look at our photos to see if they made the right choices!! We are normally very very busy as Junior Infants. We spend most of our day being busy. We are going all the time! Our minds are constantly learning and our bodies always busy. As part of our Learn Together Curriculum we have been learning how to practice Mindfulness. We take a couple of minutes a few times a day to be still and quiet and listen to calming music. We don't have to do anything during this time and the best thing about Mindfulness is - everyone can do it and no one can do it wrong. The video below is a little blurry but it will show you how we are during mindfulness. As well as Mindfulness we are still enjoying doing some Yoga during our P.E lessons now and again. 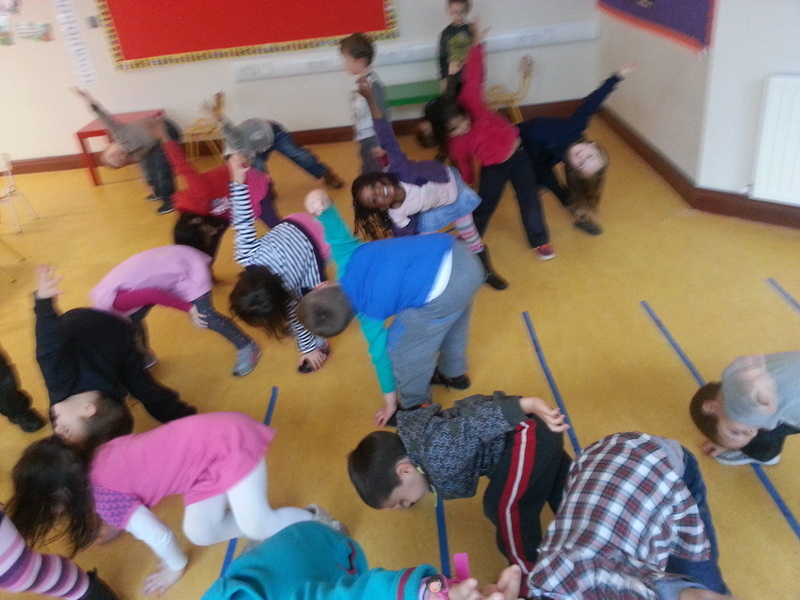 Its great fun and a brilliant way to stretch our muscles and strengthen our limbs. 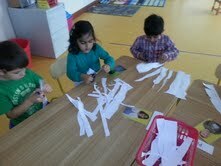 We especially enjoy using our bodies to make different shapes and things! 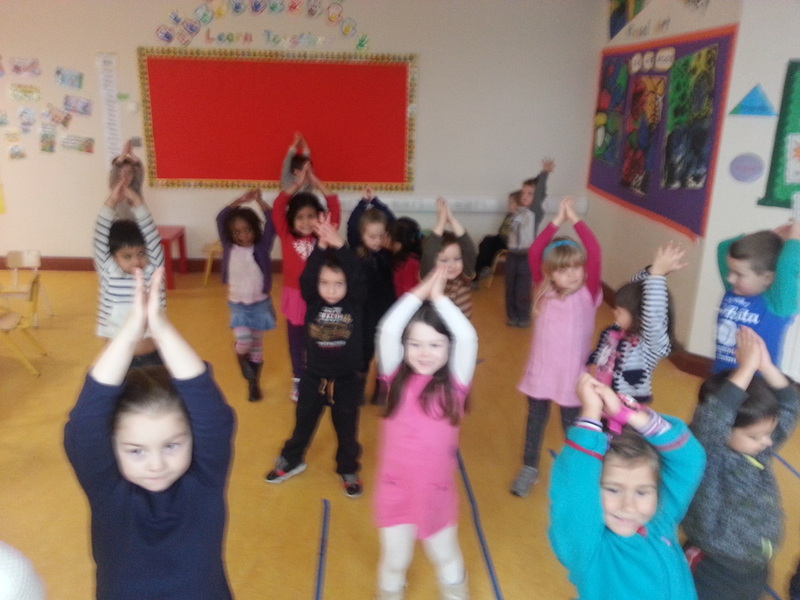 Take a look at us doing Yoga in the classroom. Can you see the different shapes we are making? We have begun to learn all about Rhyming Words and Word Families as part of our Phonics in Junior Infants! We have started with the -at Family. 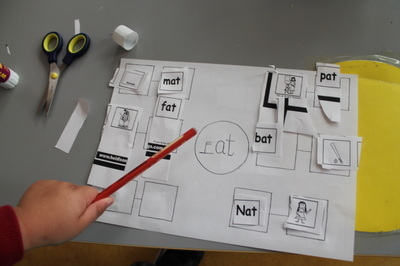 First we all thought of as many -at words as we could think of, them we completed a cut and paste activity where we matched the words and the correct picture. Have a look at how we got on! ******Parents here are some examples of fun websites we use in school to help us learn how to Rhyme in a fun and interactive way. 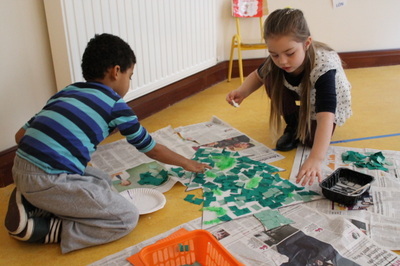 Why not have a go at home with your child, it's a great way to reinforce what they are learning in school! Over the last few weeks Junior Infants have been learning all about Data in Maths. We now know how useful Bar Charts can be in sorting information. We have created lots of different bar charts so far! 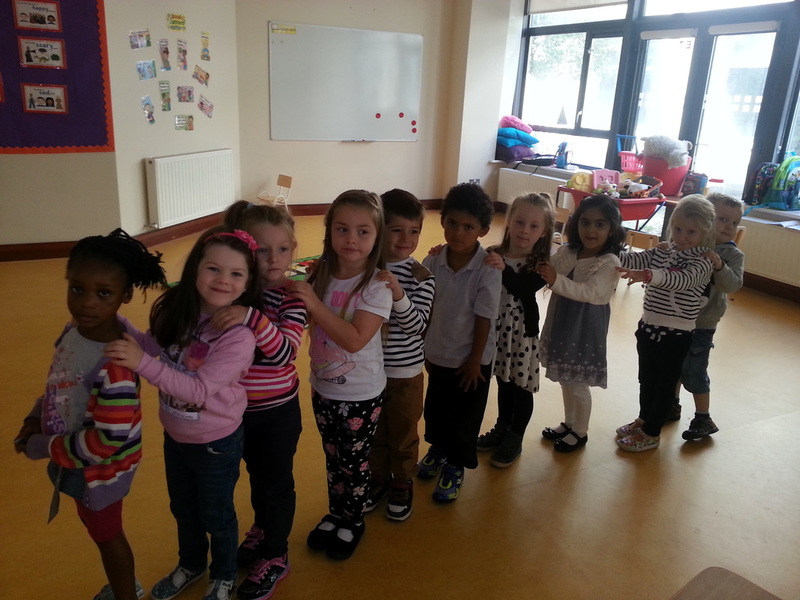 We even went outside the classroom into the hallway to make a Human Bar Chart. We sorted ourselves into our table groups and Maggie took a picture of us. Then we went back to the classroom and Maggie put the picture up on the Interactive White Board so we could discuss the Bar Chart. Say Cheese!! 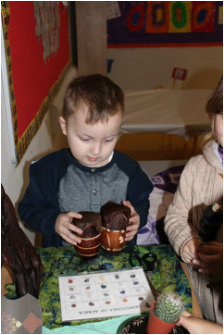 We learned all about African Tribal Masks. Then we designed and made our own. 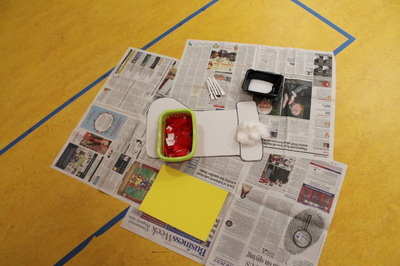 We used paints, scissors, straws and feathers and sequins. We had great fun using our masks during our SESE lessons and Drama and Music too. What better way to escape the Winter Cold than to learn all about Africa? 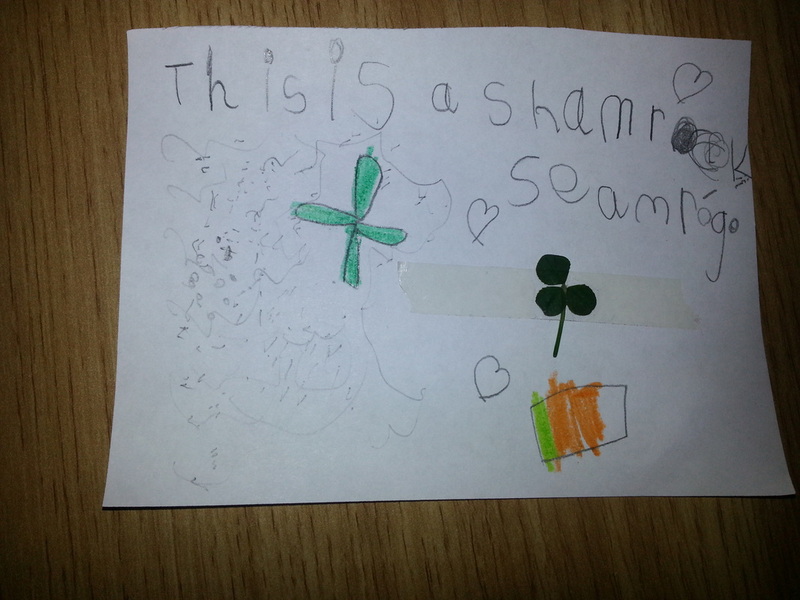 This is exactly what we are doing in Junior Infants at the moment! Make sure to ask your child all the great things they are learning about in school. They should be able to tell you about the different animals that are found in Africa and about the different types of landscapes such as Dessert, Tropical forest and Savannah. We really enjoyed working in groups to draw the different landscapes. 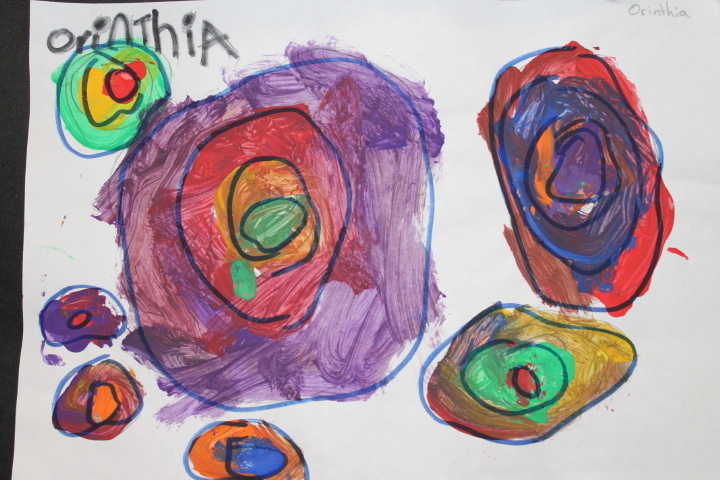 Check out our drawings and see if you can spot the different regions and some of that animals that live there! Since our Winter Break both Junior Infant teachers have noticed a big difference in the children in their class. They are really getting very good at working with a partner. Just look at the photo's below for the proof. Look at the concentration on all their faces! 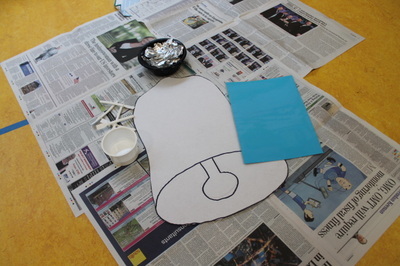 In this activity two children were working as a team. 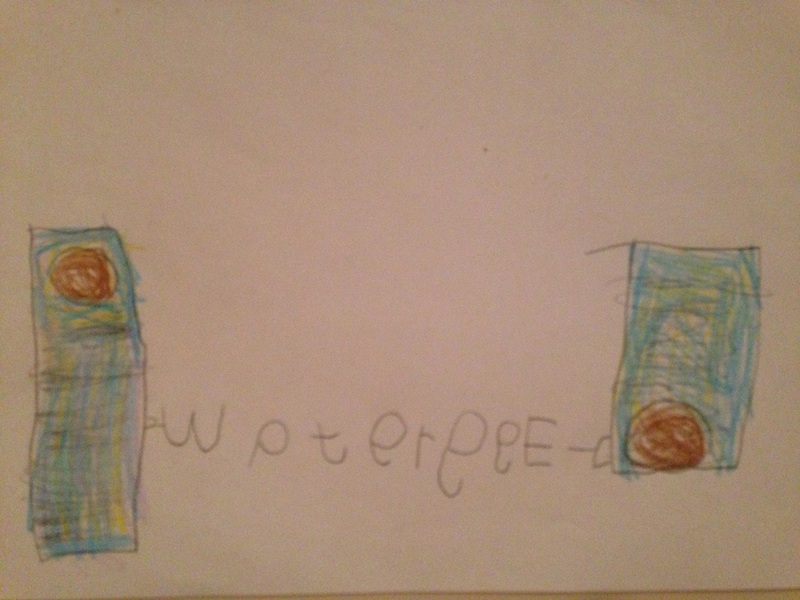 One child had to call out a Jolly Phonic sound and the other child had to find this sound and colour it it in one colour. Then they swapped over. 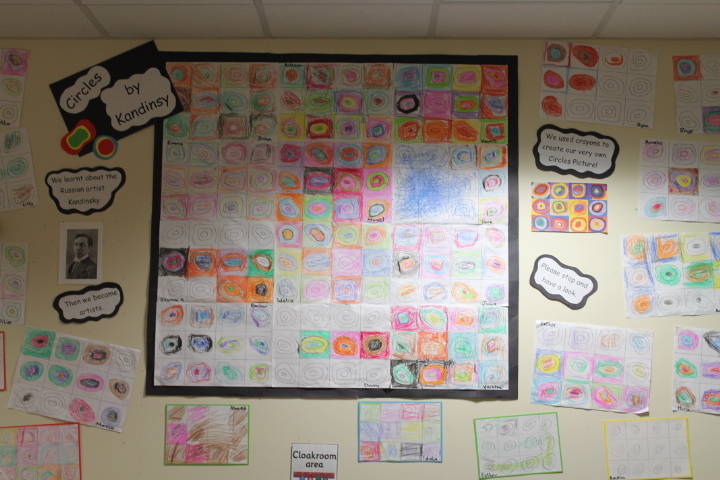 Everyone worked really hard and even came up with some great patterns too. 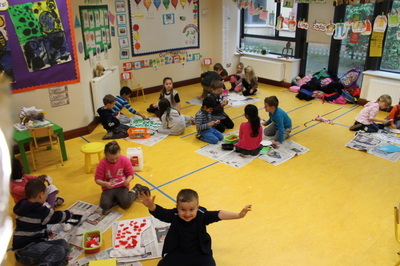 Keep up the good work Junior Infants, your teachers think you are doing a great job! Last week both Junior Infant classes were learning about the works of Wassily Kandinsky. 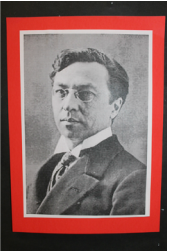 He was a Russian Artist born on December 16th 1866. Wassily first trained as a lawyer but when he was thirty he decided to change his career. He went back to college and became and artist. Wassily believed that art didn't need to be about a particular subject and that colours and shapes on their own could be art. This became known as Abstract Art. 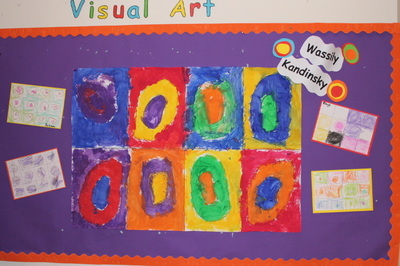 First the children in both Claire and Maggie's Class Looked at and Responded to some of Wassily's works. They described what they saw in the pictures and all came up with some very interesting and different ideas. 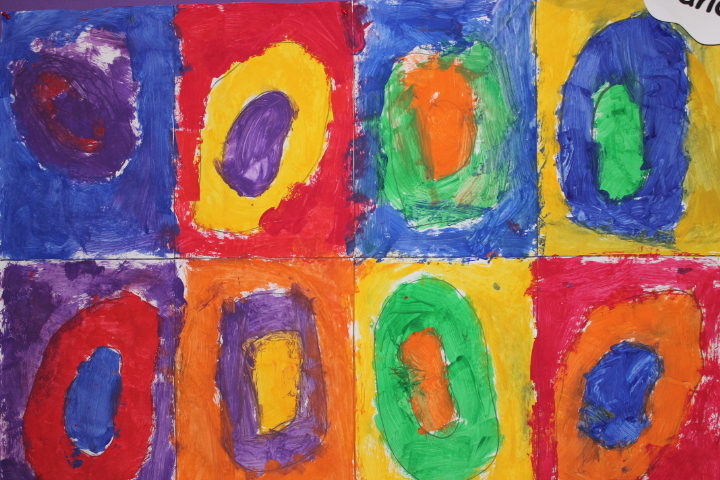 We talked about how the pictures made us feel and how we would create our own pictures like Wassily. 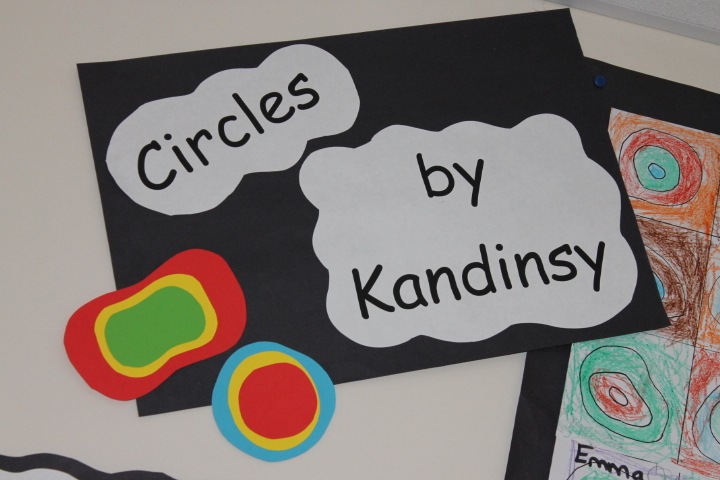 Then we became artists ourselves and created our very own versions of Wassily's famous painting 'Circles'. 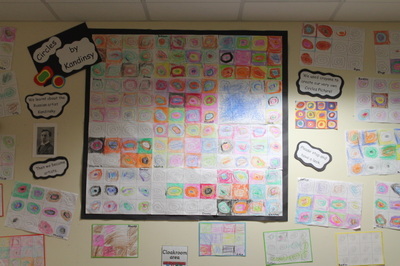 Some we did on our own and some we worked on together to make a giant 'Circles' picture. 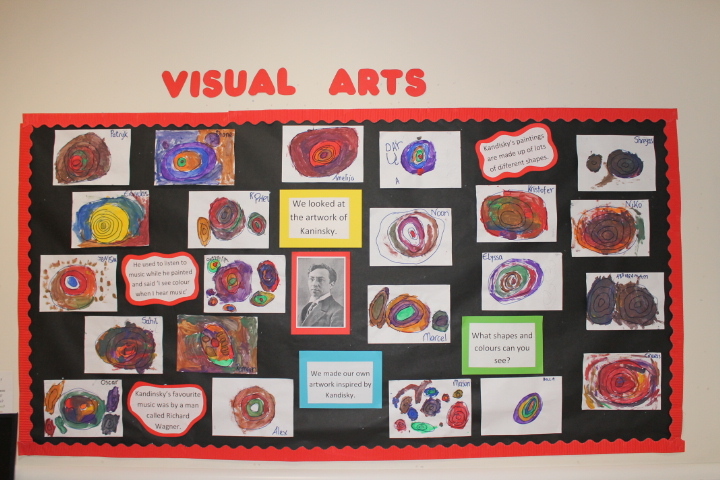 Have a look at our fabulous artwork below. This is Wassily Kandinsky's Circle Painting. These are some of ours!! Before the Christmas holidays each child received a letter containing the letters they have been learning during the term. Please feel free to revise and practice these letters and sounds further at home. 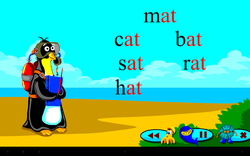 The following youtube link is also useful in helping your child with their phonics (http://www.youtube.com/watch?v=eCjJYB07aSU). 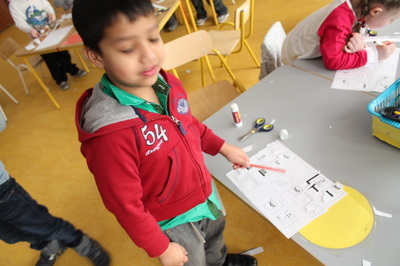 Also you could practice the formation of the letters the children have learned so far. We will also be learning a new rhyme called 'Five Little Penguins Slipping on the Ice' in January which is in the rhymes and poems section of our website. When our school reopens we will be moving onto the number 4 in maths. 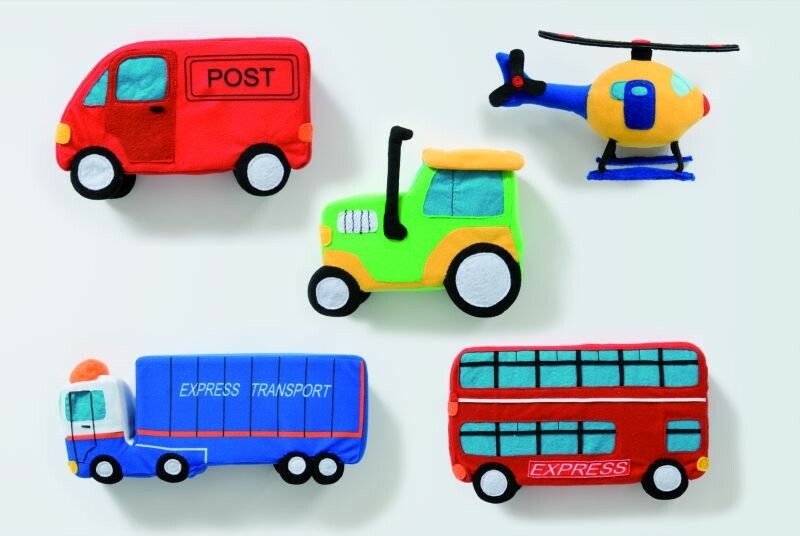 Here is a lovely interactive website that will help your child learn about the number 4 (https://hwb.wales.gov.uk/cms/hwbcontent/Shared%20Documents/VTC/story_of_4/eng/Introduction/default.htm). 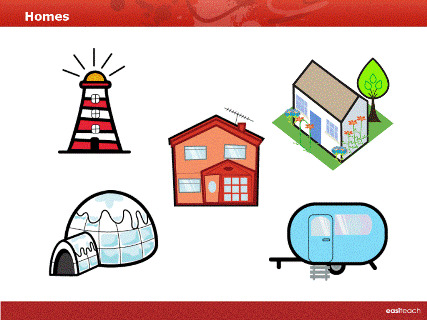 Follow the link below to a page of maths at home videos. 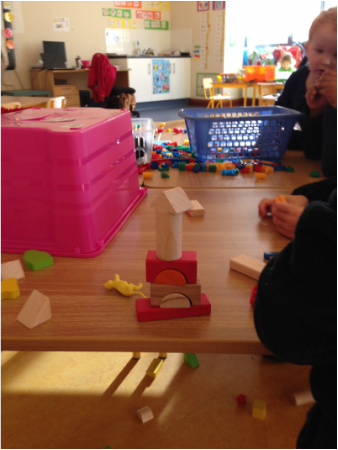 In the video 'Adding two groups of objects 5 to the parent and child are working on the number 5. This can be adapted to the number 4 and you could work up to a higher number with your child if he/she are able. You can then give your child a blank sheet of paper and ask them how many ways they can make the number 4. Below are some educational websites with great opportunities for your child to re-enforce their learning. They may need some help at the start to navigate the webpages but they enjoy these sites and the best part is they often don't realise how much they are learning as the games are great fun! This is an excellent website with a whole reading scheme of e-books. All you need to do is set up an account. It is free. There are also lots of fun games to re-enforce learning along with plenty of information for parents/guardians to help your child progress with their reading skills. Maggie and Claire's Junior Infants were very busy over the last while practicing our songs and poems for our visit to the TLC Nursing Home which is not far from Citywest ETNS. We were very excited when we found out that TLC had invited us to perform for their residents so we put a lot of effort into learning all the words and actions. 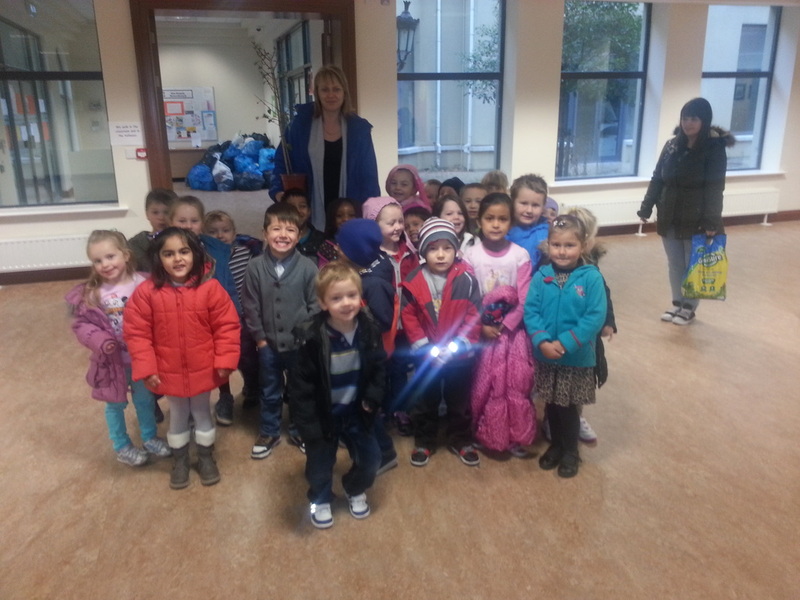 On the day the bus arrived and their were lots of smiley faces around the Junior Infant corridor. We got into our líne and held our partners hand. We made sure we had our seat belts properly fastened and off we went. Tom was the name of our bus driver and he was very nice. He even put some Christmas music on the radio for us. 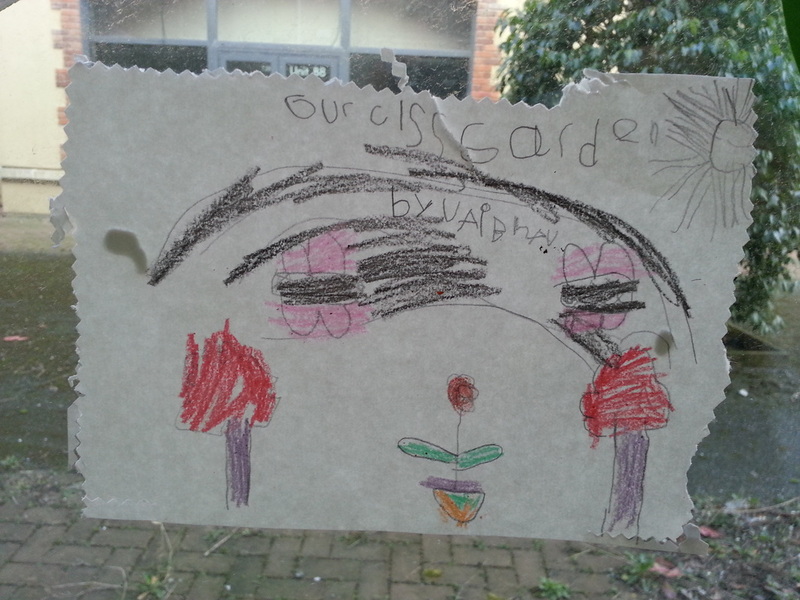 When we arrived we were met at the door by Áine. She showed us into the room and we took our coats off. We sat very quietly until everybody was ready for our performance. 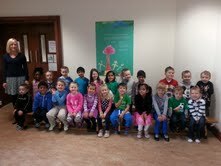 We did a brilliant job and our teachers and principal were very proud of all of us. 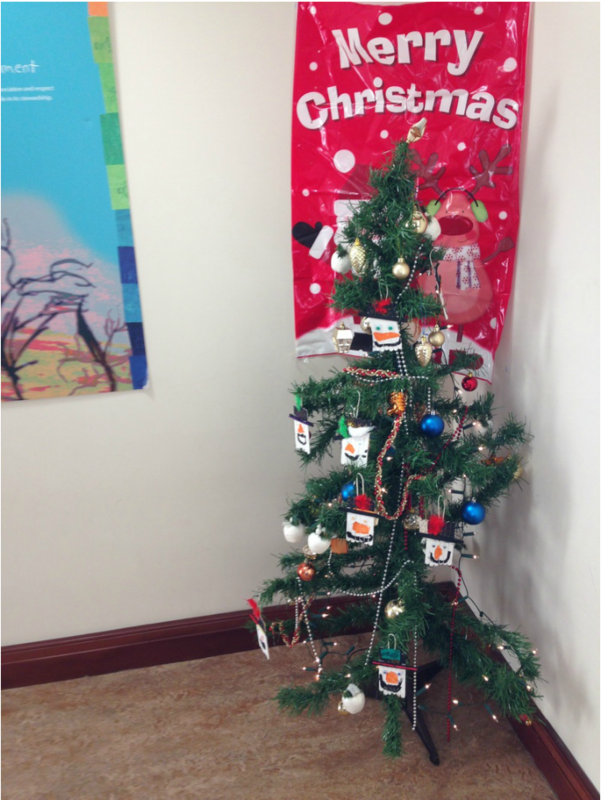 The residents and staff of TLC really enjoyed it too. They answered lots of our questions and even joined in with the songs they knew. 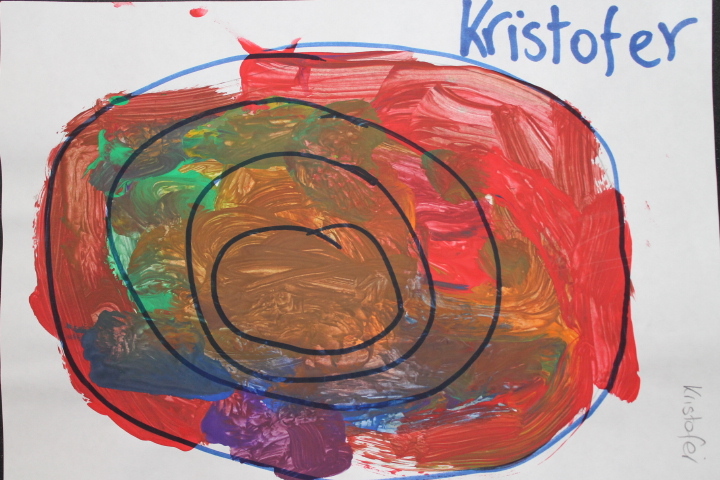 After the visit ,the boys and girls came back to their classrooms and drew their favourite part of the whole experience. 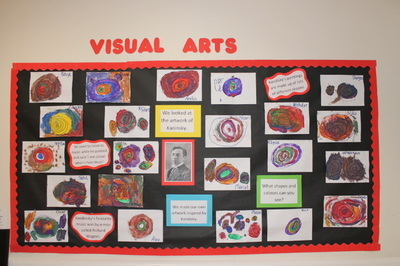 Their fabulous drawings and some photos of the day are now proudly displayed in the Junior Infant corridor for everyone to see! This was our very first trip outside of school and we can't wait for the next one. Thank you very much TLC for having us and for providing the bus for us too. We had a great time and we're glad you enjoyed it too! 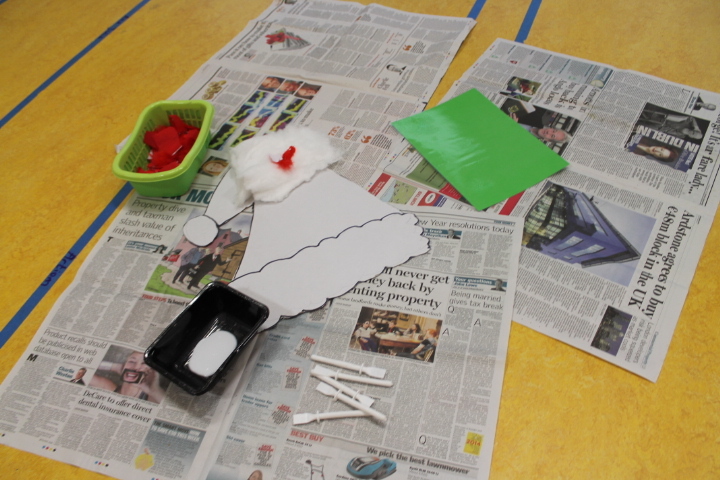 Both Claire and Maggie's class have been very busy making our own Christmas decorations. We are getting very good at working together in groups. We like to share, and help each other and are now working well as a team. 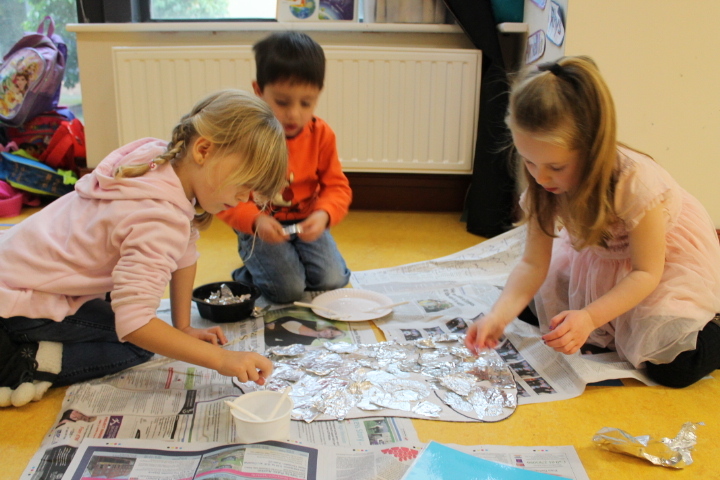 We used fabric, and lots of different types of paper and even tin foil. 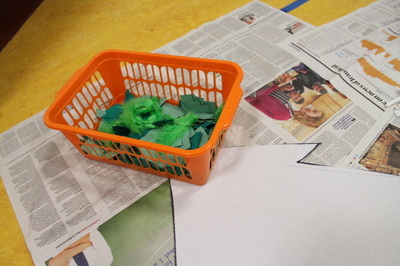 We glued all of these onto cardboard. This is called collage. We made Christmas Trees using printing techniques and Snow Flakes by cutting around folded paper. It was super fun to unfold our designs to see how they turned out. We also had a great time constructing, designing and decorating the individual Snow Men we made. Deciding on what colour feather, glitter and matchsticks to add turned out to be a difficult decision for everyone! 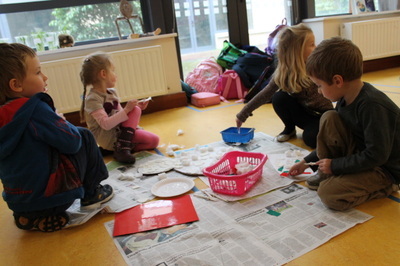 Our Art lesson went on a little bit longer than expected! Our decorations are now adding some festive cheer to the main entrance hall and some are hanging on our Christmas Tress in the GP Hall. Why not have a look! 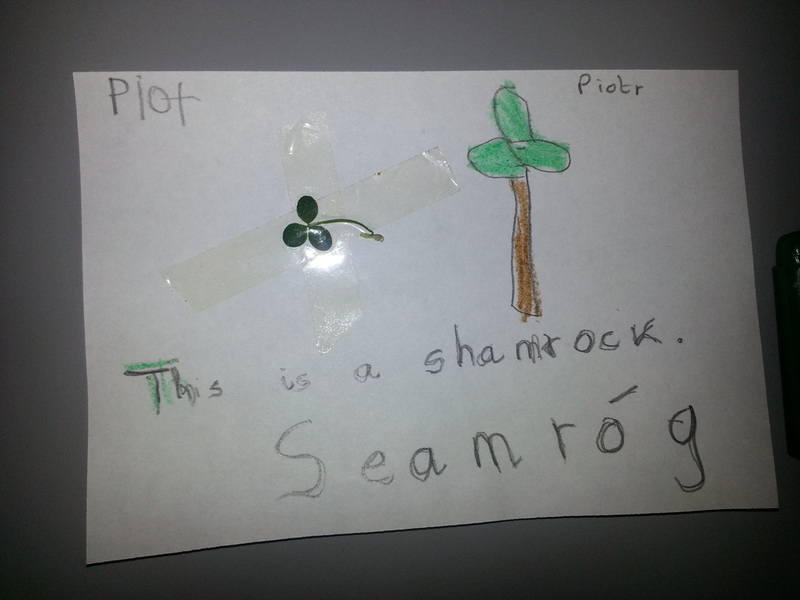 From the 10th -17th of November 2013 schools all over the country are celebrating Science Week. Citywest ETNS is one of those schools. Maggie's Class are enjoying lots of Science this week and each day are carrying out a different experiment. On Monday we made Lava Lamps! There was great excitement looking at the bubbles rise through the oil. 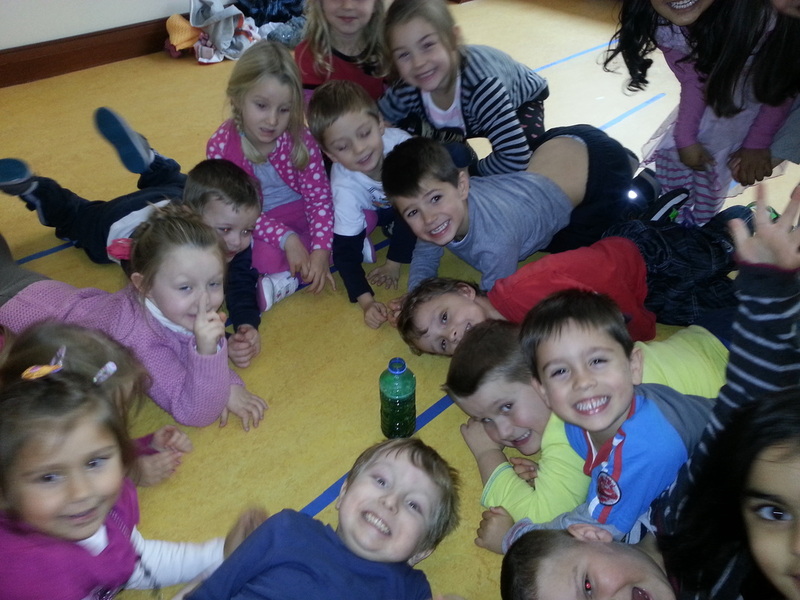 We noticed how the oil and water did not mix, even when we turned the bottle upside down and shook it. 1. Pour a little bit of water into the bottle. 2. Pour in oil until the bottle is about 3/4 full. 3. Drop ten drops of food colouring into the bottle and let it settle to the bottom. 4. Break up the Alks-Seltzer tablet and drop into the bottle. 5. Sit back and watch the bubbles just like a Lava Lamp. 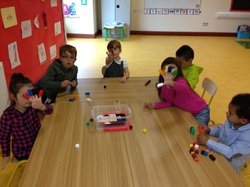 Have a look at the concentration on all of our mini-scientist faces. 1. Fill the two containers with tap water. 2. Add about 6 tablespoons of salt in one container and stir it well with a tablespoon until the salt has completely dissolved in the water. 3. 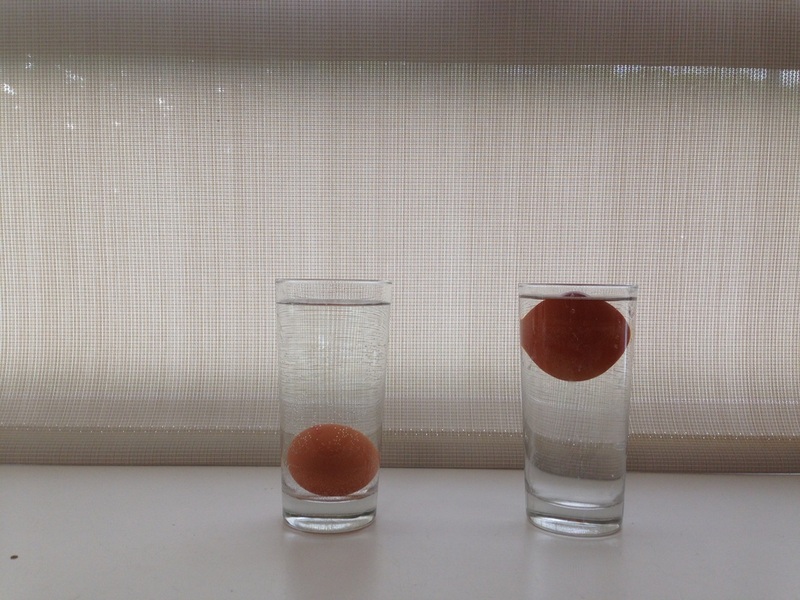 Place one egg in each of the containers and observe which one of the eggs float in the container and which one sinks. 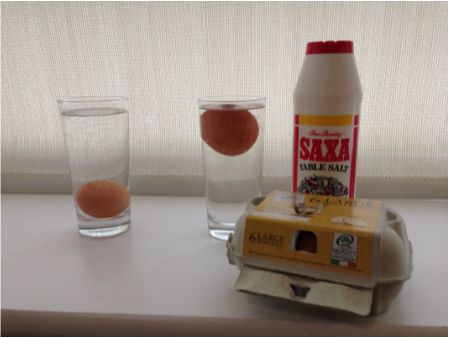 Both Maggie's and Claire's classes had great fun predicting and guessing what would happen to the eggs when we put them in water and then in the salt water! 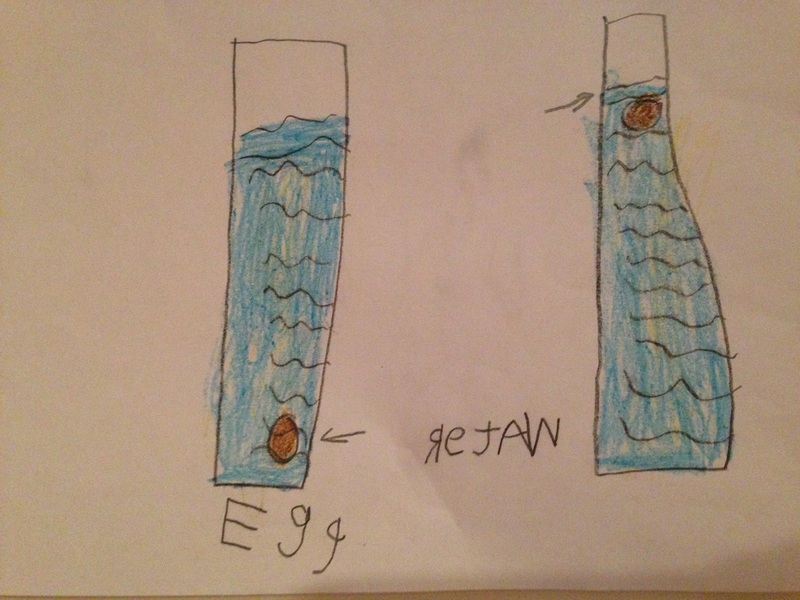 We learned that the egg in the glass containing just water sank to the bottom but when we added salt to the water it made the water heavier than the egg and therefore it floated to the top. Claire's class then put on their scientist hats! We drew a diagram of the experiment and labelled it. 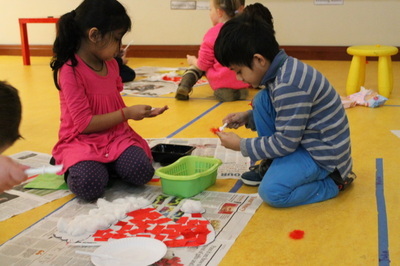 This was a really cool and useful experiment as it introduced the term floating and sinking to the boys and girls which will we be learning about further during the year. 1. Pour some 7-Up into a glass. 3. Watch the raisins dance (the bubbles are full of air and they attach to the raisins, making them light and float the top of the liquid. When they reach the top the bubbles burst and the raisins are too heavy and sink to the bottom). 1. Rub the balloon on your hair or some woollen material (this will create static electricity). 2. 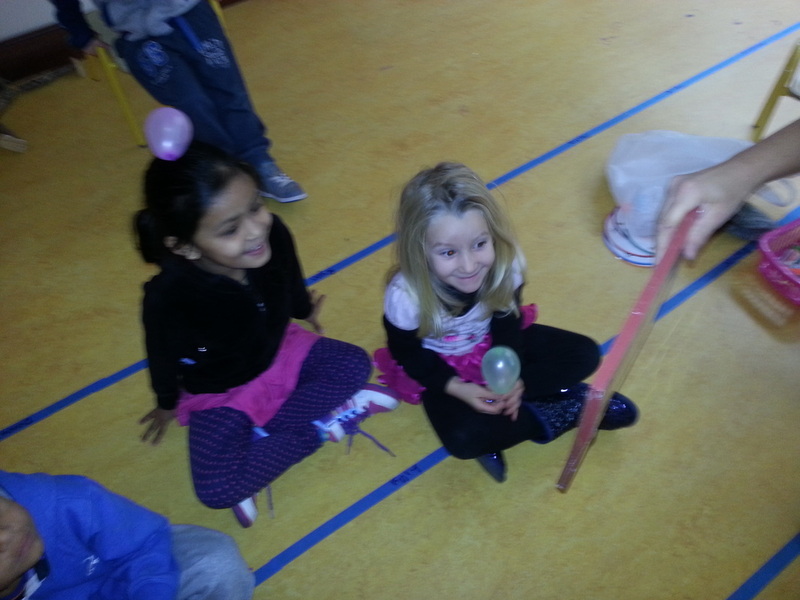 Pull the balloon away from your hair and see how your hair is attracted to the balloon. 3. Put the balloon beside the can (but not touching it) and start to move it away from the can. It's like magic. See how the balloon pulls the can without touching it. 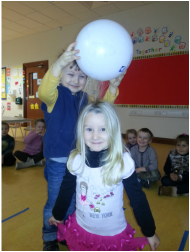 Maggie and Claire's class had great fun on Thursday exploring the effects of static electricity. 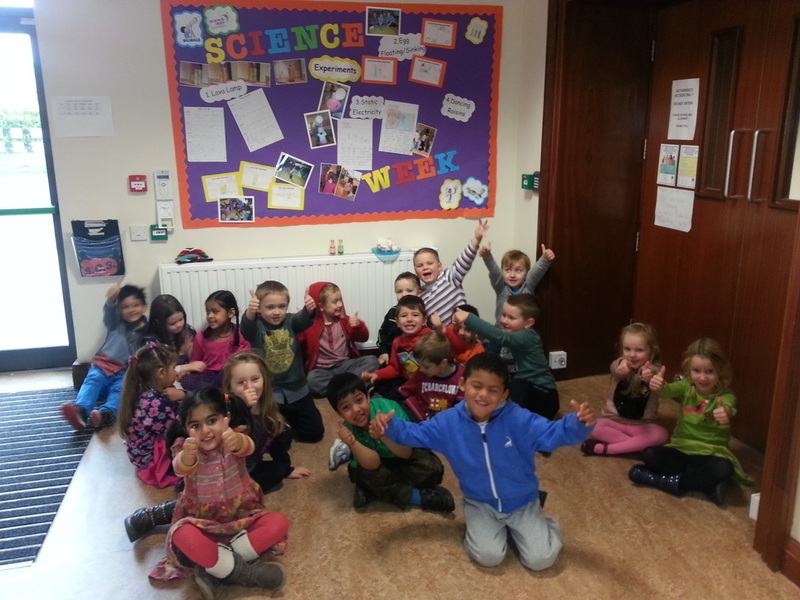 Science Week in Citywest Educate Together N.S. was a great success. It was great for the whole school to get involved and share the experiments. 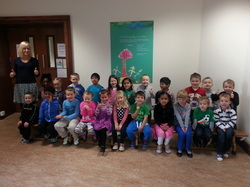 The teachers are very proud of all the boys and girls and think that we have some budding scientists on our hands. 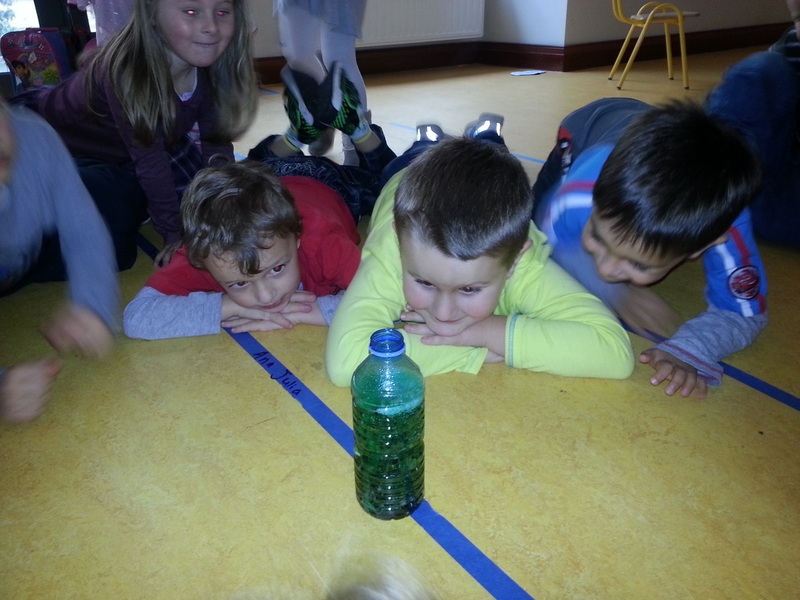 The boys and girls were so enthusiastic about learning all about and carrying out the experiments. Make sure to ask them about them....they are full of information. Our display board has a small selection of the cool experiments that took place so make sure you come and have a look at it. It is in our school hall. A big thumbs up all round. Looking forward to next years Science Week already! 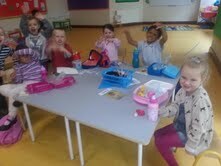 All the boys and girls in Maggie's Class have been learning Yoga Poses. So far we know The Mountain, The Tree, The Triangle and The Chair. 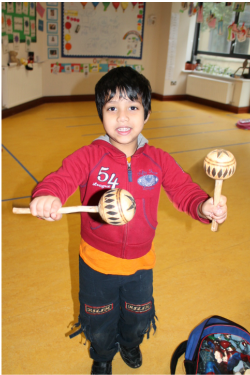 It's great fun practising but sometimes tricky to balance. Claire's and Maggie's class has begun to include socio-dramatic and sand play into the daily play rota during the week. 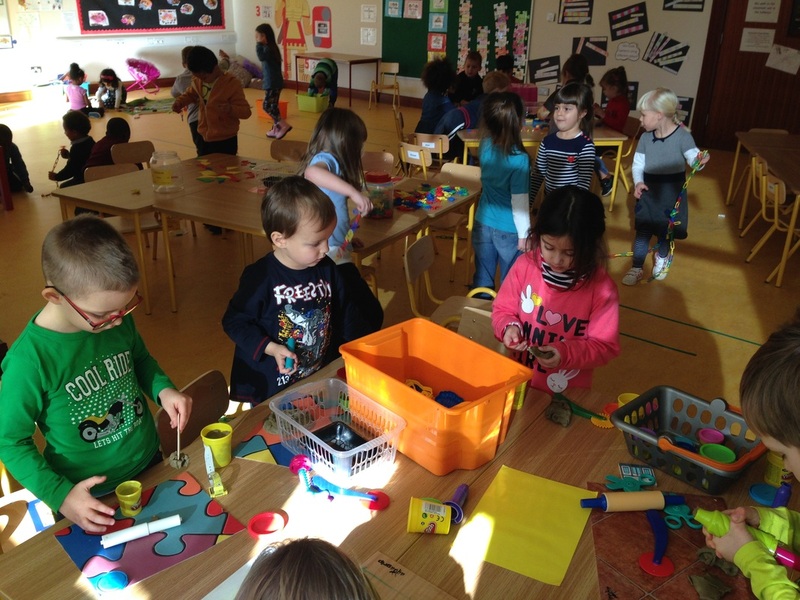 These activities take place daily during sessions of play which usually last about 35-45 minutes. 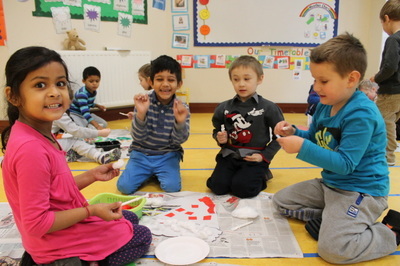 We try to incorporate and include as many areas as possible of the curriculum while the children are playing. During play rota children experience activities that motivate them and make learning exciting and enjoyable. They experience an array of language and skills which help them develop and progress in a fun and exciting way! 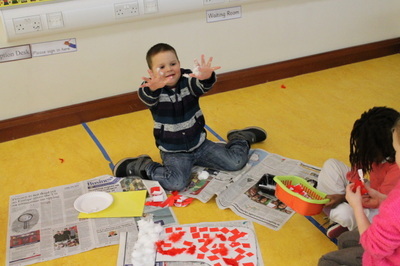 Claire's class have been using role play to help them learn....... See how much fun we have been having!!! All the little fingers turned green in Maggie's Class when we planted our class tree to mark National Tree Day and our first year of school. 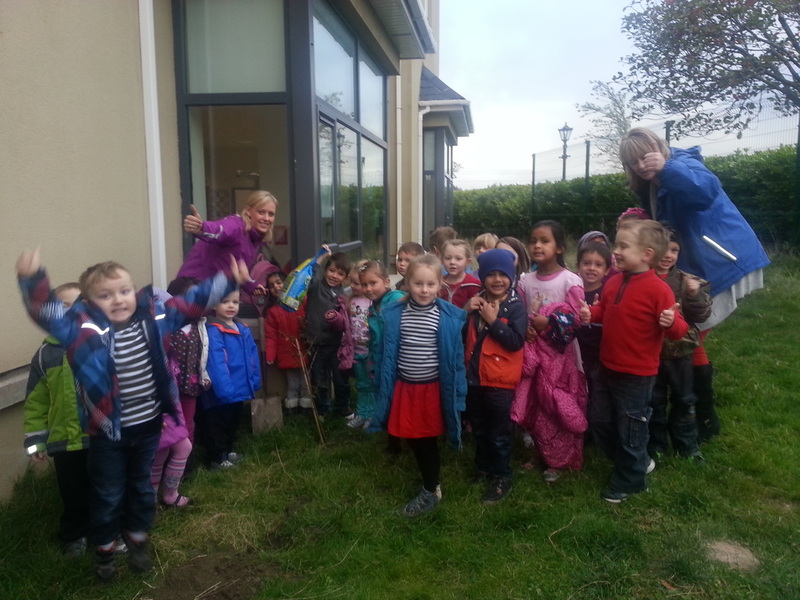 We all helped to carry out the shovel, dig the hole, plant the tree and put compost in to help our tree grow. All we have to do now is watch it grow. I wonder how big it will be when we get to 6th class? 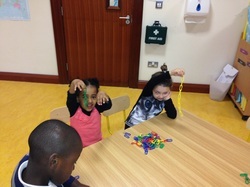 We have been learning to sort in Maggie's Class. We sorted things into sets based on their colour and we even sorted ourselves into sets of boys and girls! Shapes are all around us! 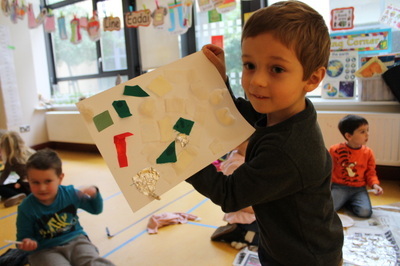 Both Junior Infant classes have been learning all about shapes. They have been really clever in recognising different shapes such as circle, square, rectangle and triangle but we have been focusing on what makes the shapes different from each other! We have been using language such as sides, straight sides, curved sides, long and short sides. We have been counting the sides on each shape and we now know that a rectangle has 2 straight long sides and 2 straight short sides, a square has 4 straight sides of all the same length, a triangle has 3 straight sides and a circle has one curved side that goes around and around. 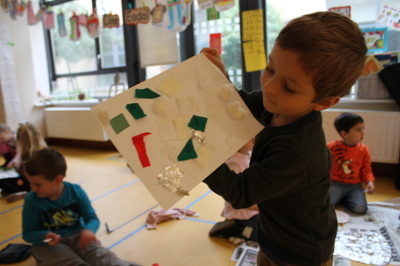 We also watched the shape song on youtube to help us remember the names of the shapes and the number of sides they have (http://www.youtube.com/watch?v=pfRuLS-Vnjs). All the children love this song so have them sing it for you at home if you get the chance. 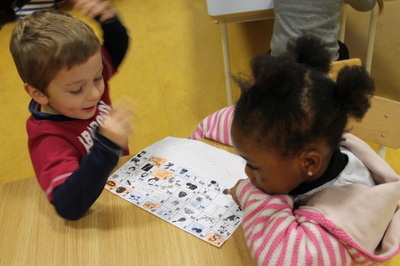 It really helps to use your fingers for counting to reinforce the learning! 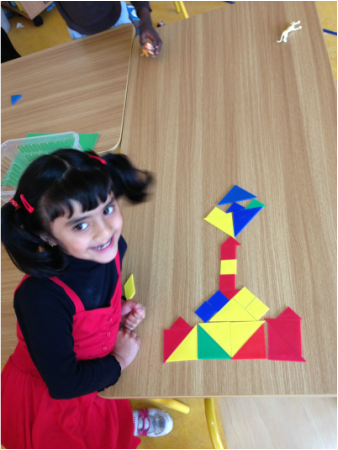 Check out our photos of our maths lessons so far on shapes! 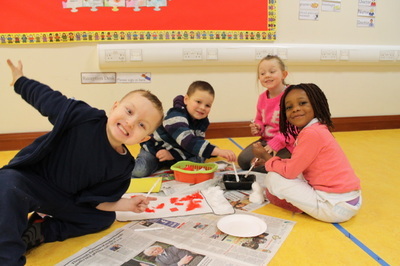 Photo Time in Maggie's Class! 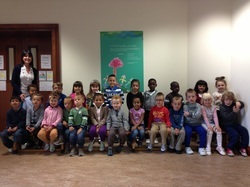 Our very first class photo! Maggie's Class were very busy with their 'Families' topic. 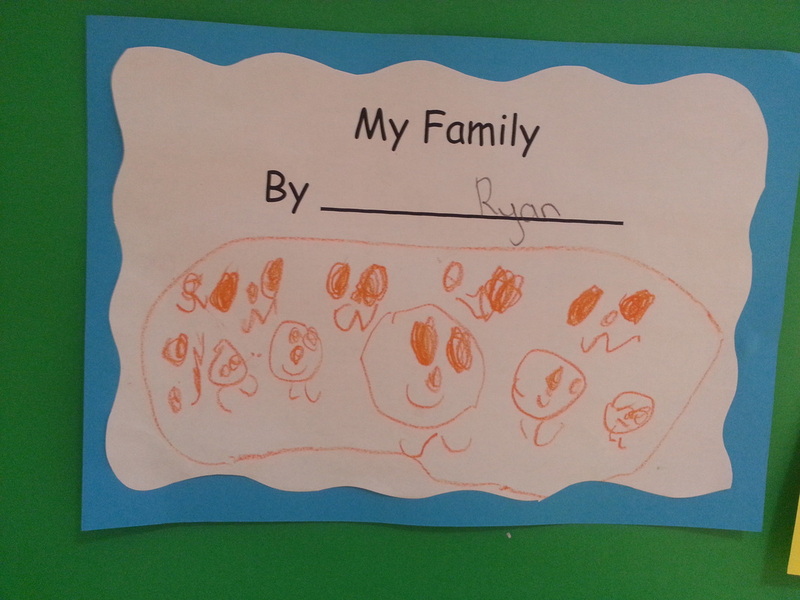 After we talked about our families, big and small we drew a picture of them. 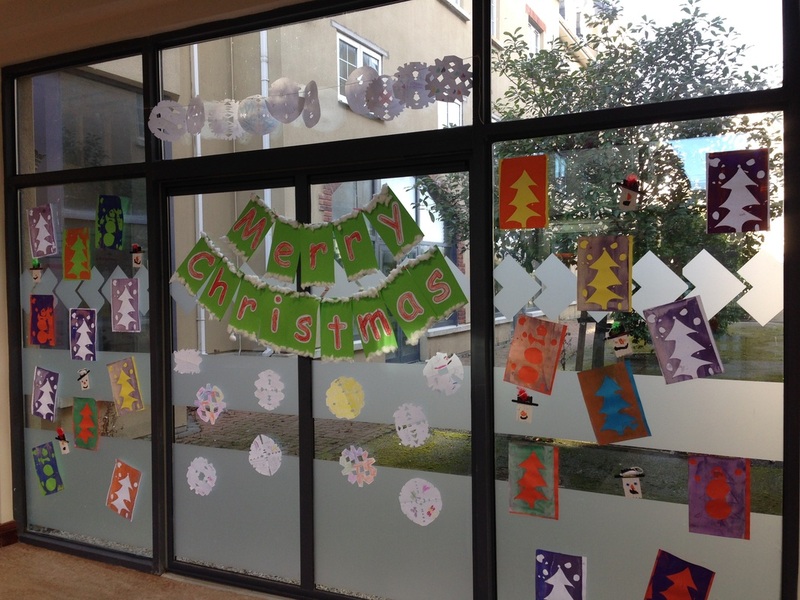 Take a look at our display! 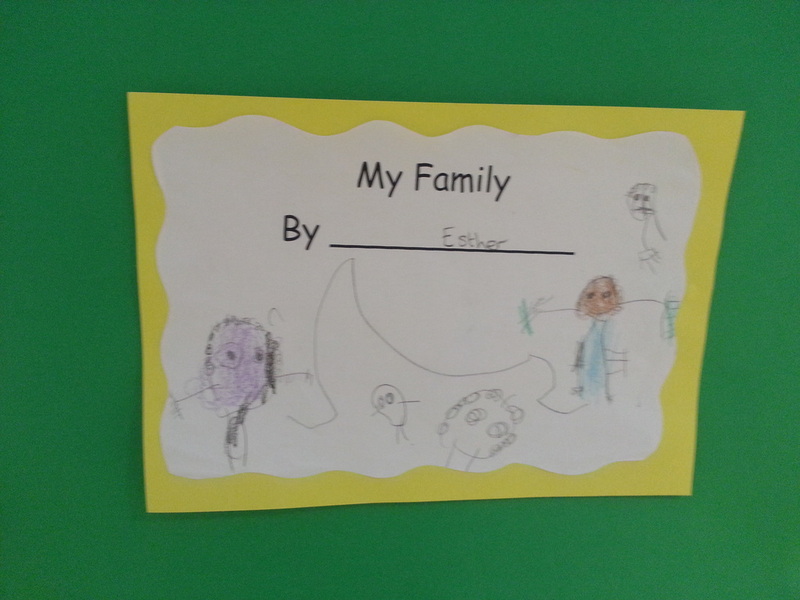 As part of our History and SPHE lessons, Maggie and Claire's class have been learning about and discussing 'Our Families'. 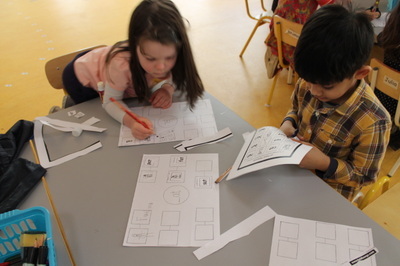 Together we talked about our families and in the end we decided that no two families are exactly the same and that families can be different from one another. Some boys and girls have big families with lots of sisters and brothers while others are smaller. Some have grandparents, aunts, uncles and cousins, while others even included family pets! All the children drew lovely pictures of their families and afterwards we had a show and tell to present our drawings to the class. Claire even showed a picture of her family. She doesn't think her mum would be too happy to find out that the children said she was Claire's grandmother when asked 'who do you think this could be in the photo of my family'?! 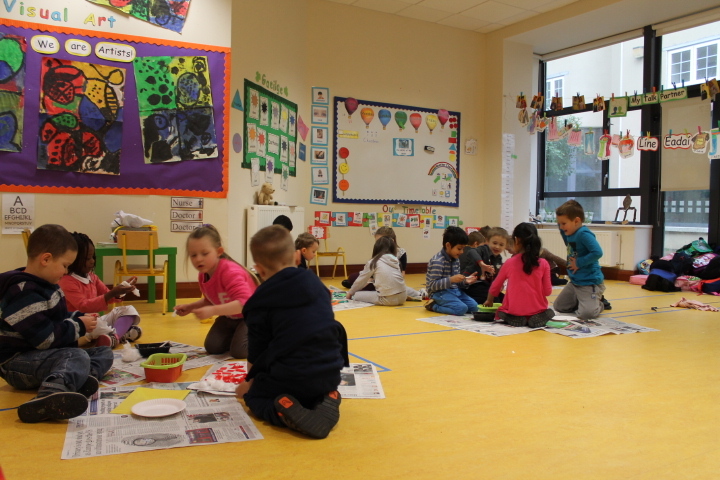 Week 3 of Junior Infants! 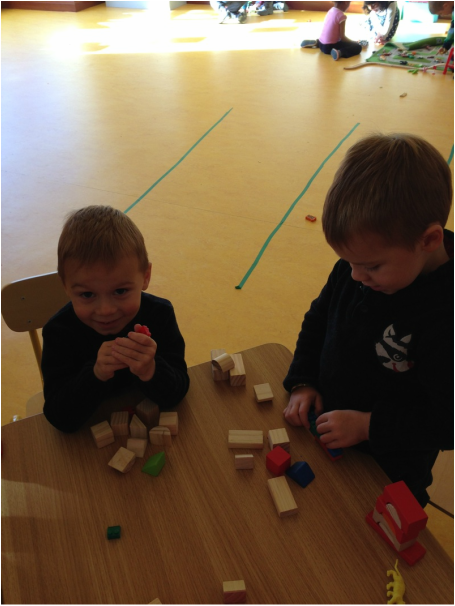 We have been learning through play! been building towers out of bricks. 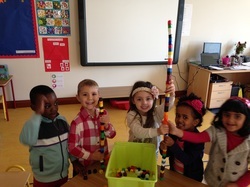 There was fierce competition to see who could build the tallest! I think the girls might have just won in this instance! We have also been learning about things that match in maths. 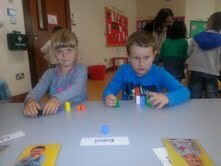 We used the building blocks, links and disks to make pairs and sets of the same colour. This is something you can do with your child at home to introduce the concept of matching and reinforce language such as same, match, different and not the same. Simple activities like matching shoes, socks, pegs and other objects at home can help your child to enjoy and understand maths. 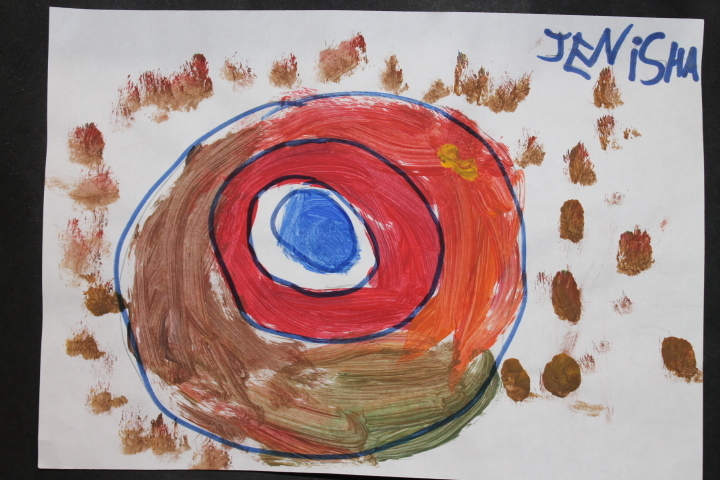 Finally in Art and to celebrate Friendship Week we made handprints using different colours paints. It was very exciting, if a little messy! 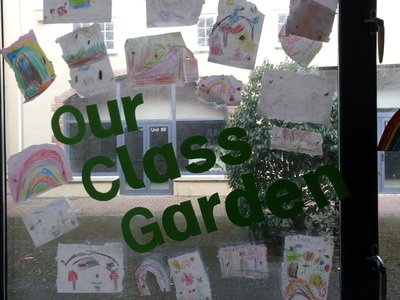 Our class handprints will go on display shortly so have a look out for them the next time you collect your child from school. Week 2 At School Already! What a busy day we had on Monday! We sang some of the songs when have been learning, practiced how to hold our pencils and use scissors and we even managed to find our new seats in the classroom. All the boys and girls now have their names on the back of their seats to help them remember what table they are sitting at. 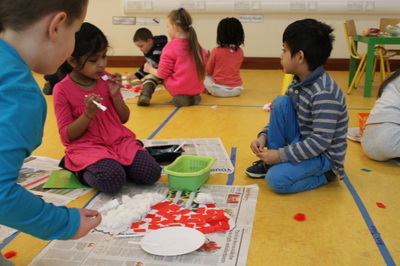 Our tables have been given different colour names to help the children line up for yard time, collect their bags and coats and arrange themselves at circle time. Our table colours are red, yellow, blue and green! On Monday we talked about what a self-portrait is. We talked about what colour eyes and hair we have. We talked about the shape of our faces and where we would draw our nose and mouth. 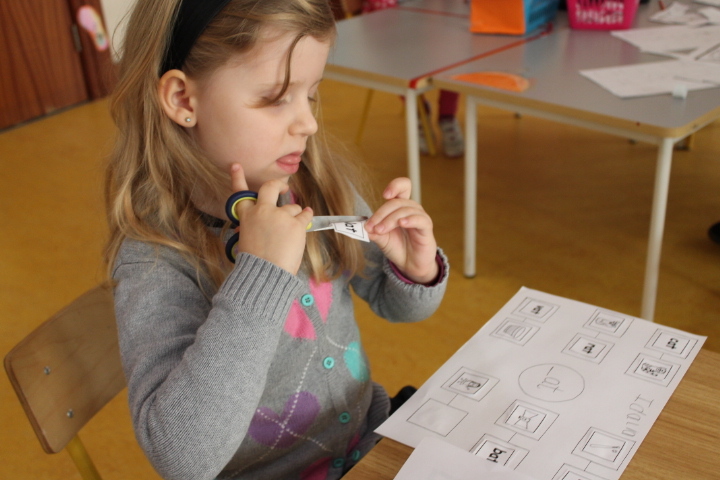 We imagined that we were looking in a mirror and then we drew a picture of ourselves. We each had a picture of ourselves to help us in case we forgot anything. It was great fun. Here are a couple of our finished portraits. 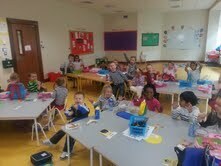 It was a big day in Junior Infants today. We used our scissors for the first time! 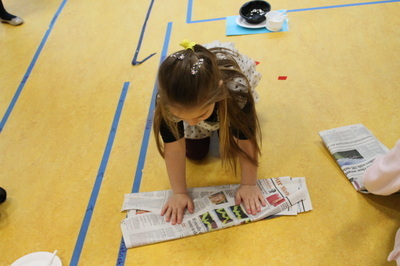 We were very very careful and made sure to use them safely as they are very sharp. Can you see how we are concentrating?? For our first time we did a great job. Look who brought in a book for Maggie's class library! We all said thank you and Maggie read the story to us while we were eating our lunch. The story was Little Red Riding Hood. We really enjoyed pretending to be different characters. Look at how scary we are at being the Big Bad Wolf. Oh dear! 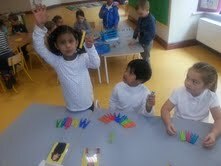 Maggie noticed that her pegs, lollypop sticks, cubes and shapes were all mixed up! She needed us to help her sort them. First we talked about ways we could sort them such as by their shape, their colour or their size. We decided we would match them up by their colour. Each table had a different box to sort out. Look at what a good job we did. Maggie was very pleased with the great job we did. 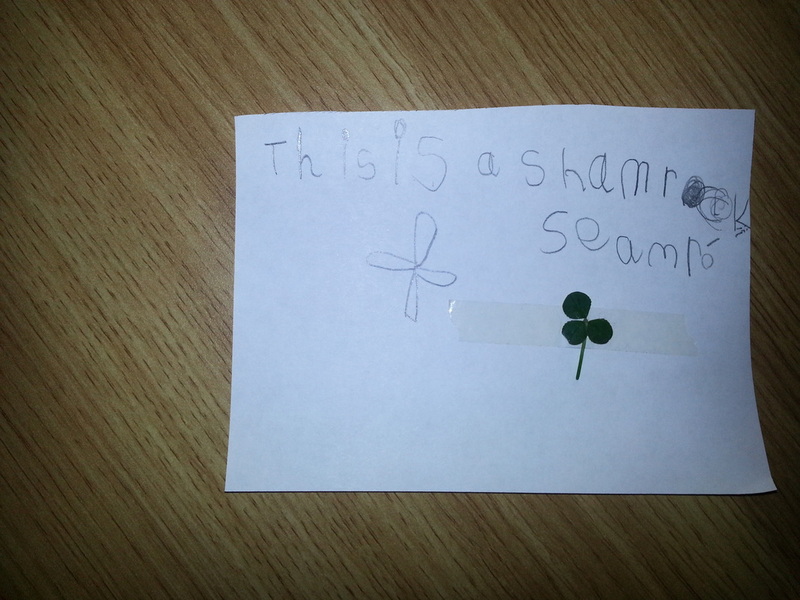 In Junior Infants we have been learning some new rhymes. 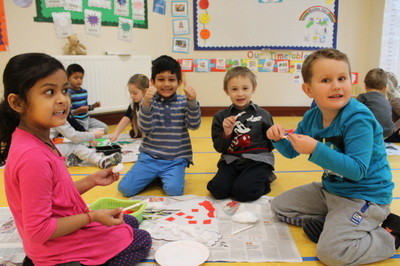 They are great fun and have helped us all to get to know each other. They are called Che Che Koolay and The Itsy Bitsy Spider. Che Che Koolay is an echo song from Ghana in Africa! 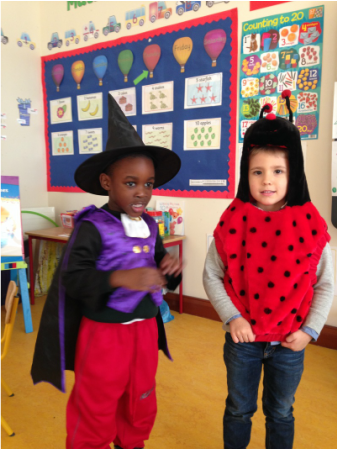 Click on our Songs and Poems page to read the words to Che Che Koolay and The Itsy Bitsy Spider. Ask us to sing them for you. We're still learning so if we forget something, you can help us out now that you can read the words! We also did fabulous colouring. 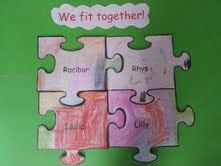 We designed and coloured our own jigsaw pieces to show how we all fit together as a class now. 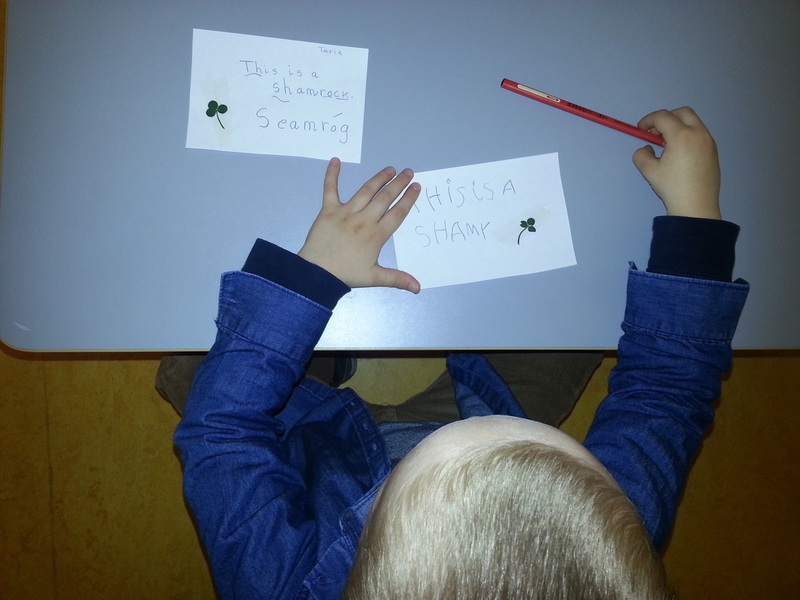 This will also help us to learn how to write our names and to learn the names of all the boys and girls in our class. 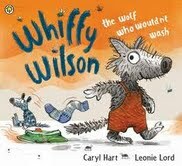 In Junior Infants we have been listening to stories such as Wiffy Wilson and The Gruffalo. Some of us have already read these stories at home but we made sure we didn't spoil the ending for those who hadn't read the story before. We have a lovely comfy carpet to sit on for Story Time and we are learning how to sit nicely and keep our hands to ourselves during Story Time. choo choo, here comes the quiet train! 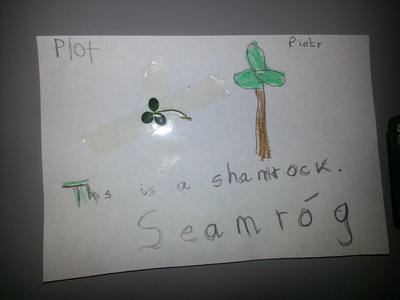 We have been working very hard at practicing our Líne. We pretend we are a very quiet train and put our hands on the shoulder of the person in front of us. This is all very new to us so it will take a while to get it right but we are trying very hard and it is getting much better every day. See how good we are getting! Our teacher is very proud of us already.